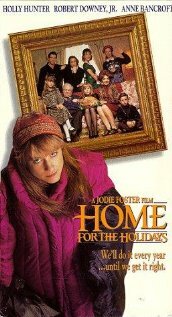 Every year around this time of the year we watch “Home For The Holidays” – directed by Jodi Foster, starring Holly Hunter, Robert Downey Jr. and Anne Bancroft. It is hilarious – but not a movie that I suggest for everybody – as there is controversial subject matter throughout the film. And if you are highly sensitive to language and other sensitive topics such as sexuality and homosexuality – this may not be the film for you. However, for some families – these topics are a part of their lives and they have to deal with them. Jodi Foster does a great job at bringing out the humor in sensitive situations. Greg and I love it because it has what we like to call ‘characters’. Every family has them – the people who are ‘larger than life – and twice as natural’ – who bring hilarity and drama to family holiday gatherings. Every time I watch it I am struck by the different personalities of this family unit – the person who is rigid and unforgiving and judgmental the one who is over indulgent – the one that is senile – the black sheep – the enabler and so on. Your dysfunctional family unit has nothing on these guys! But they also love each other – and that is the common theme throughout. Even when they don’t understand each other – there is still love. No matter how painful the “get-togethers” are – they keep doing it year after year. The Nat King Cole song at the end, “The Very Thought Of You” is especially touching while pictures of everyone’s past life is showed in the background. It gets me every time – the simple beauty of family and love. Below enjoy the trailer of this great movie.